This section describes a Web service testing tool, SoapUI, which can be used to inspect WSDL documents, invoke Web service, and simulate Web service. What is SoapUI? SoapUI is the leading tool for Web service testing. 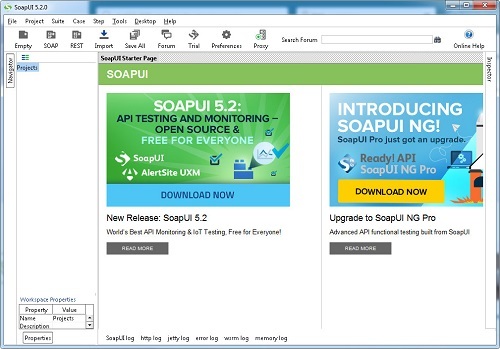 SoapUI is an open source product, originally developed by a Swedish company, Eviware Software AB, in 2006. SoapUI is supported by SmartBear Software since it acquired Eviware in 2011. SoapUI has 2 editions: SoapUI Free and SoapUI Pro. Inspecting WSDL SOAP Web Services - Importing and viewing WSDL documents and more. Invoking Web Services - Automatic generating of Web Service requests; Managing multiple service endpoints; etc. Developing Web Services - Generating server and client code; Validating Web service definitions and messages; etc.